Getting ready for school has never been this fun! Set of 72 beginning phonics activities on 36 double-sided cards teach children all they need for success including initial & final sounds and rhyming words. 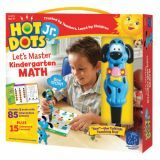 For use with Hot Dots® Jr. Ace the Talking, Teaching Dog® (EI-2350), available separately. Grades PreK+. Getting ready for school has never been this fun! 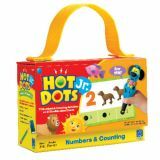 Set of 72 numbers & counting activities on 36 double-sided cards teach children all they need for success including number words and sequencing. 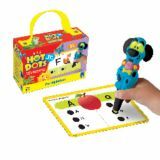 For use with Hot Dots® Jr. Ace the Talking, Teaching Dog® (EI-2350), available separately. Grades PreK+. Getting ready for school has never been this fun! Set of 72 alphabet activities on 36 double-sided cards teach children all they need for success including upper and lowercase letters and sequencing. 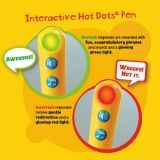 For use with Hot Dots® Jr. Ace the Talking, Teaching Dog® (EI-2350), available separately. Grades PreK+. Preschoolers love using “Ace"—the Talking, Teaching Dog® as they enjoy these fun stories, each with 11 interactive early learning activities designed to support school readiness. Retellings of four favorite, “must-know” fairy tales made interactive with Ollie—the Talking, Teaching Owl!™ Classic fairy tales include The Gingerbread Man, The Elves and the Shoemaker, The Ugly Duckling, and Jack and the Beanstalk. 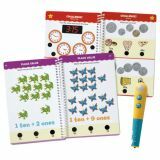 This two-book set with included Hot Dots® pen provides children with 100 lessons on a variety of math skills, from counting & numbers and patterns to time and fractions. Fifteen of the 100 lessons are challenge activities that prepare children for skills at the next grade level. This two-book set with included “Ace"—the Talking, Teaching Dog® pen provides children with 100 lessons on a variety of math skills, from counting & numbers and patterns to time and fractions. Fifteen of the 100 lessons are challenge activities that prepare children for skills at the next grade level. 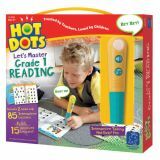 This two-book set with included Hot Dots® pen provides children with 100 lessons on a variety of reading and language arts skills, from reading comprehension and vocabulary to spelling and punctuation. Fifteen of the 100 lessons are challenge activities that prepare children for skills at the next grade level.